David Wills is a landowner and farmer. David’s professional interests include Blagford Properties. His community and charitable interests involve the Royal Bath & West of England Society, Bristol Cathedral Trust, Chairman of FarmLink Education Ltd, Langford Trust for Animal Health and Welfare and Bristol Care and Repair. He is a past Master of the Merchant Venturers. Since 1970 Mary has farmed in partnership with her husband Tom at Castle Farm near Bristol. They founded the Castlemere herd of pedigree Guernseys and within a few years enjoyed showing, particularly at the Royal Bath and West. They also organised visits from local schools for many years. They established a Farm Shop in the mid eighties and combined it with dairy farming for the next decade and a half. After retiring from dairy farming they retained a small beef enterprise and other numerous diversifications. Outside the farm Mary has had an almost lifelong involvement with Chew Valley Young Farmers Club being its first lady Chairman. She was also President of Somerset Federation for the Young Farmers Year 1992-1993. With such an interest in the Guernsey Breed Tom and Mary joined the English Guernsey Cattle Society where Mary soon became a member of Council and Editor of their National magazine until 1986. She was also the Society President in 1992. In 1987 Mary was persuaded to take a more active role in the NFU. After taking the chair of the North Somerset Group she was elected to the Somerset Milk Committee. In 1989 Mary had the honour of being elected Vice President of the Somerset County Branch and became its first lady Chairman in 1991. London beckoned and in 1992 Mary earned election as a Council delegate. She remained in this post until stepping down in 2000. In 1996 Mary was made Chairman of the Public Affairs Committee on the day the BSE crisis broke! Through her NFU tenure Mary was also a Director of Taste of the West for several years representing the interests of the farming industry. The NFU has had an education for school children for many years. In the early nineties Mary was on a committee that instigated the programme where an ex-Head Teacher was employed to concentrate on getting information to school teachers with written material and numerous events. The next step was for the NFU and the Royal Agricultural Society of England (RASE) to join forces and Farm And Countryside Education (FACE) was formed. For all her endeavors Mary was awarded the MBE in 1997 for services to agriculture and consumer affairs. Mary is currently a trustee and vice Chair of the charity FarmLink Education Ltd. She also enjoys being Chairman of the Communications Committee of the Royal Bath and West Agricultural Society and puts in ‘an hour or two’ every week [in the season] for the National Trust at Tyntesfield House, Wraxall as a Room Interpreter. John Alvis is Director of the family owned Alvis Bros Ltd which is a Farming Company based in North Somerset. The business produces 3500 tonnes of Cheese, two thirds of which is ‘Organic’ along with 100 tonnes of whey cream and butter. There is a strong emphasis on quality assurance and traceability which supports a wide customer profile including some of the High Street multiples as well as the Farmshop. 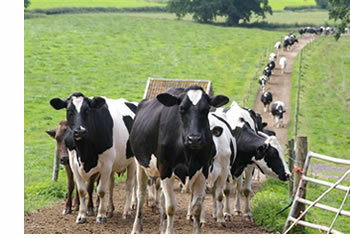 The farms cover more than 4500 acres with 1000 milking cows, 40% of which are ‘Organic’, 4,000 tonnes of cheese, p.a. to the Cheese Dairy. In addition there are beef, arable, pig and contracting enterprises. John is the founder of FarmLink. Andrew Densham is a retired solicitor. Andrew’s community and charitable interests include Royal Agricultural Benevolent Institution, of which he was National Chairman, and FarmLink. He is a past Master of the Merchant Venturers. Nick’s ‘daytime job’ is Farm Operations Director for Alvis Bros. Having started off as ‘the boy’ in 1982 on one of the dairy farms he is now responsible for the business’ three dairy farms, beef, arable, pig and contracting enterprises and looks after the non farming estate as well. He has had various involvements away from the business including national Chairman of the Institute of Agricultural Management, Chairman of the Somerset Centre of Management in Agriculture, regional Chairman of the National Pig Association and Director of Meat South West. He was the instigator of the North Somerset Agricultural Society’s Meal Wheel and has worked closely with FACE and SW CoRE to deliver the Year of Food and Farming in the South West. Adrian has worked in the dairy industry since 1992. Initially with Unigate until it sold its dairy interests in 2000 to Dairy Crest. Adrian transferred to Dairy Crest and then moved to Yeo Valley in 2001 as Commercial Director. He became Managing Director of Yeo Valley in 2003 and then Executive Chairman in 2017. Adrian is married with two children and lives in Buckinghamshire. The family have a small holding where they breed Herdwick Sheep, keep a couple of RSCPA Shetland ponies and try to manage two spaniel’s! Adrian’s sporting passion is rugby and he plays for a local veterans team. A Northumbrian by birth, Brian Kirkup was educated at the Duke’s Grammar School, Alnwick and at the University of Leeds where he studied Chemistry. He qualified as a teacher following his post graduate studies at the University of Oxford. He first taught at Ashington Grammar School in Northumberland, before he was appointed Head of Chemistry and then Director of Sixth Form Studies at Benfield School, a large purpose built comprehensive school in Newcastle upon Tyne. Promotion to a Deputy Headship at Worle School in Weston-super-Mare brought him to the West Country. Whilst in this post he studied on a part-time basis at the University of Bath where he obtained a Master of Education degree in Business Management and Education. His first Headship was at Shaftesbury School in North Dorset and his second at Churchill School in North Somerset before his retirement in 2001. He then became an Educational Consultant on a part-time basis before completely retiring in 2006. He leads a busy life – Chairman of Cheddar Cricket Club, member of the Executive at Winscombe Rugby Club, a Rotarian, Governor at two local secondary schools, treasurer of The Gabblers Club (an after dinner speaking club for sixth form students), amateur dramatics, music and photography – as well as enjoying travelling and family life with his wife Jennifer in Cheddar. Mark trained with Hollingdales, qualifying as a Chartered Accountant in 1994. He worked as a manager for Hollingdales and Kidsons Impey until 1998. His portfolio of clients included charities and owner managed businesses. In 1998 Mark set up, together with a colleague, a successful firm McEwen & Pooley that provided accountancy and taxation services to local charities and businesses. On the retirement of Mark’s business partner in early 2004, McEwen & Pooley merged with The John Hollingdale Partnership to become Hollingdale Pooley. Mark has developed a strong understanding of the accountancy, audit and taxation issues facing organisations and individuals. His areas of expertise include Charities, Owner managed businesses, Trust tax and Inheritance tax planning. Jeanette practiced as a commercial contracts / projects lawyer until 2006, when she took time out to have a family. Since then, she has been very active in a number of community roles, including Chair of Wrington Pre-School. She has studied extensively, gaining RHS qualifications which have enabled her to share her passion for gardening with others through her new garden design business. She became a trustee of farm link in 2013.